The week-long Fiesta will end at the FHTA Dive Fiji EXPO which is organised by FHTA annually. This event is aimed specifically at showcasing Fiji’s awesome diving to key wholesalers and media from Fiji’s key dive source markets and take place 22nd March 2019 at the Sofitel Fiji Resort on Denarau, Nadi. The FHTA Dive Fiji EXPO has shaped up to be the biggest dive event in Fiji’s yearly calendar with over 20+ Buyers and media, and 30 Fiji Dive Operators, and 2019 could be even better. A tentative itinerary for the Fiesta can be viewed here. 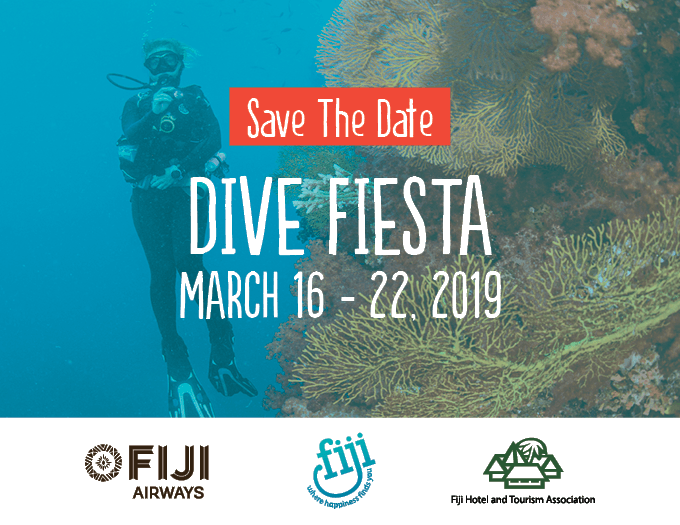 Registrations to the Fiji Dive Fiesta are open to all dive wholesalers/dive travel agencies that sell and package Fiji dive destinations/products. This is also open to those agencies that may be new to selling Fiji Dive and are keen to explore opportunities to forge networks and business with dive operators from within Fiji. Do not use upper case or capitals unless at the beginning of a sentence or name. These will be printed on EXPO badges.